So, is that the "original" text? And is there anywhere online with the original Japanese text? I've found an old english version (which gave me no indication where this line comes in), but I'd be interested in seeing the Japanese version. 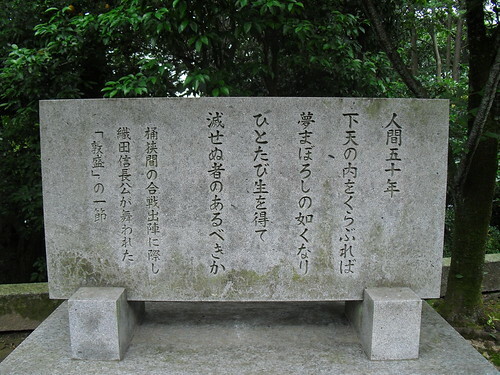 The とて simply indicates that the passage is a quote. This site has the full text for the Noh Atsumori, but it notes that the famous quote isn't present at all in the Noh version, only in the Kouwakamai (a different kind of theatre) version. I haven't had any luck finding an online transcription of the Kouwaka Atsumori (Nobunaga's favorite phrase is all over the place, however), but the Kouwakamai songs/plays were collected in books called "Mai no Hon". Searching for 幸若舞 and 舞の本 might help narrow down your search. This site has the full text for the Noh Atsumori, but it notes that the famous quote isn't present at all in the Noh version, only in the Kouwakamai (a different kind of theatre) version. If figured the とて had some sort of purpose like that. Like I said, I read the English version and didn't see anything remotely like it, so it makes sense that it isn't in the Noh version. Strange though. I appreciate you both posting the info on Noh Atsumori. We returned from Japan and my wife bought a DVD that we both really enjoyed. It is hard to find any info on it. Done in 1992 and is simply called ODA NOBUNAGA and stars Watanabe Ken and Sanada Hiroyuki, Chiba no Sonny, Way Tomaisaburo. I mention a few of the actors because none of them have any info on this fine movie. At 4 hrs long, it has a very well enacted Kouwakamai by Ken. Separately it has an outtake with a famous Noh instructor giving Ken some instruction. Anyway I appreciate your post now I know that there is not much published on this subject. I did not think it would be hard to find. u mean Taira no Atsumori??? Taira no Atsumori is the eponymous character in the Noh drama "Atsumori." It is a line from the play -- or, rather, a variant play -- that is being discussed here. oh.. I got it. Arigato, AJBryant. Nobunaga exhibit a Noh Atsumori actor. Atsumori will be performed at Oetenma shrine in Fukuoka Jan 20. Not mp3, but Youtube has several varieties of the Kouwakamai Atumori. Here's one. I found an article on Atsumori. "Oda Nobunaga ga Aishita Maboroshi no Geino Kowaka Mai," Bijuaru Nihon no Kassen, 28 June 2005, pp. 20-21. It has some decent information on Nobunaga and Atsumori. You know, it's kind of ridiculous to say you found some decent information on Nobunaga and Atsumori and not even reveal a smidgen of what that information is. So out with it! It's almost as ridiculous as saying you can't stand baseball (soccer all the way), and then to post that it means a lot to you that Japan beat Cuba and the US in the WBC. I just don't get the meaning of posts like these. The article has a picture of the Atsumori performance at Oetenma Shrine in Fukuoka. Performed every Jan. 20th. It also describes the orgin as well giving the history of Taira Atsumori. It gives more detail on a meeting between a monk from Owari and Takeda Shingen. I have been trying to find a good translation, but the only one I've found (just through Google and such. The library's closed at the moment. so shoot me.) is one from James Araki, which I must say I don't much care for. "Should man, after his fifty years, scan the sub-celestial realm, all will prove a dream, an illusion; to acquire life and perish not ... this cannot be." He captures the basic gist of the whole thing, obviously, but fails to produce - if I might be so bold to say so - anything approaching a direct literal translation. I attempted my own - which I will fully acknowledge is also horribly inadequate; and, after all, I'm no professional literary scholar and translator like Araki. I stumbled mainly over the phrase 下天, which just serves to make the translation as a whole seem all the more awkward. I don't suppose anyone has come across a better translation? Man, what a blowhardy translation! There are much better (less ridiculous?) ones out there. Come on - "sub-celestial"?? Tenka is typically simply translated as "the realm" - as in "Nobunaga wanted to solidify his hold on the realm". Tenka is typically simply translated as "the realm" - as in "Nobunaga wanted to solidify his hold on the realm". But it's not 天下, it's 下天, at least in Ameth's picture. I'm not sure what the significance is of it being "Katen" ("Shimoama"?) vs. "Tenka", but it's not Tenka. Serves me right for reading and posting from my cellphone- I'll blame the small screen. I thought it was Tenka too at first.. but then I looked again, and realized Katen is not a word I am familiar with. at all. Yeah. I should have thought to look in Kojien or another encyclopedia. Duh. How stupid am I? Also, thanks to nagaeyari for prodding me to realize it's probably pronounced 'geten', not katen. The proof in the Daijisen pudding: http://kotobank.jp/word/下天. How is this for a translation? I've played around with the Japanese and trying to optimize many, many translations into something that actually flows fairly well in sensible English. I have no problem with that Obenjo.